We get it: sometimes one bedroom doesn’t cut it. You need more space to fit in a personal home office, or you want a place for your friends and family to crash when they visit. Our luxury two bedroom apartment floor plans at Alexan West Dallas have you covered, offering the beds and baths that you need, along with the large living spaces and awesome amenities you want to ensure that you can rest in style. One of our many two bedroom luxury apartments, the Trend-Setter, earns its name through its great versatility, allowing you and your small group of loved ones to customize and create your home into your own image. The two bedrooms sit on opposite ends of the apartment, offering much needed privacy during the early and late hours of the day; they are also large enough to accommodate comfortable king-sized beds, and they connect to their own deluxe bathrooms – featuring large soaking tubs, stand-in showers, or dual vanity sinks – and expansive walk-in closets. Swap recipes and share snacks in our open-concept kitchen, which features ample pantry and cabinet space along with a chef’s island for additional serving space. Lounge back, dine, or play in our gigantic living room, complete with a private patio overlooking our beautiful community or splendid Dallas views. Finally, work on laundry from the comfort of home using the large utility closet and washer and dryer connections close to the front door. Expand your options for a perfect home here at Alexan West Dallas. 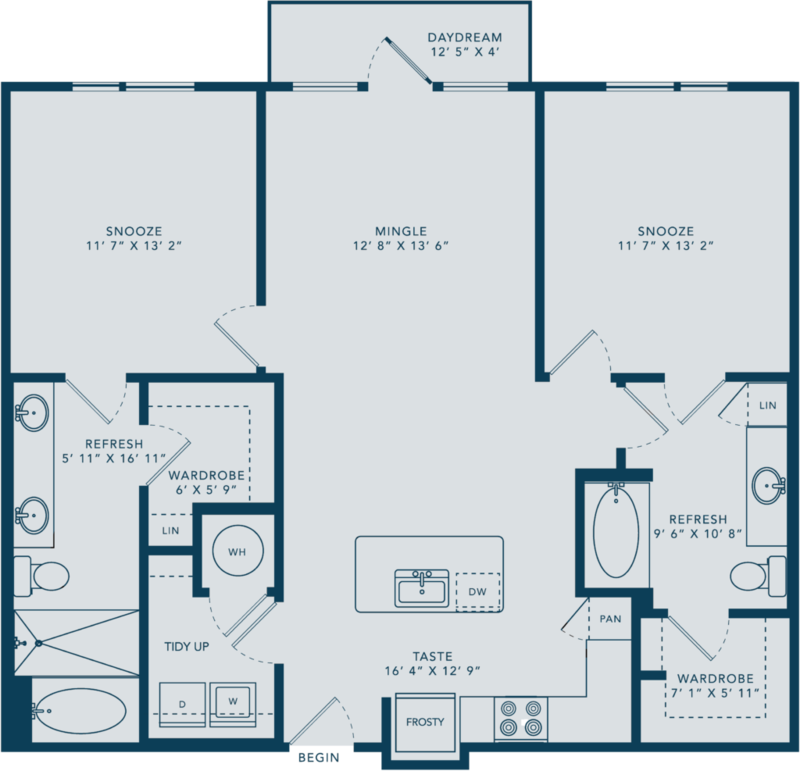 Schedule a tour of The Trend-Setter along with our other amazing luxury two bedroom apartment floor plans today.